Aspidites melanocephalus is a species of snake in the python family. The body is muscular with a flattened profile, while the tail tapers to a thin point. The top of the head is covered by large symmetrical scales. The color pattern consists of shades of black, dark grey, brown, gold, and cream arranged in a striped or brindled pattern. The belly is light-coloured, flecked with darker spots. The head is shiny black that also extends down the neck and throat for several inches. Hatchling can be housed for around 6 to 12 months in a 5-10 liter tub & then upgrade accordingly with these fast growing, food orientated reptiles. Juveniles until Sub-adult size can be maintained in a 1.2 x 0.6 x 0.45 meters (3.5 x 1.8 x 1.5 feet) enclosure. Adult Aspidites melanocephalus should be housed in an enclosure of 1.8 x 0.6 x 0.4 meters (6 x 2 x 1.5 feet) with a divider at 0.8 meters length in order to contain the heat better on the warm side. 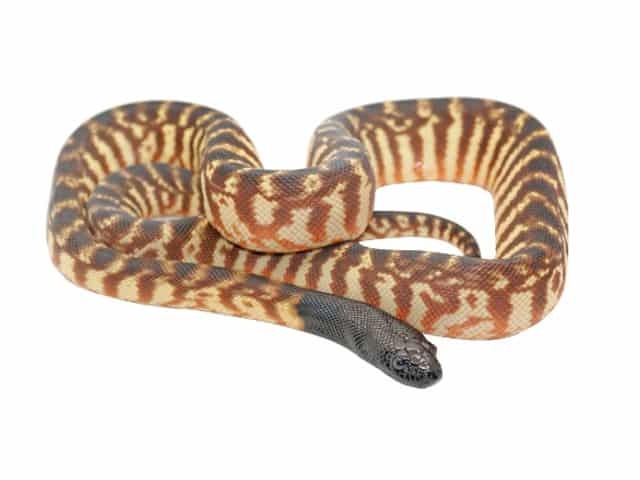 It is recommended that BHP’s are housed individually as they are Cannibals by nature & prey on other reptiles in the wild, there has been many mention of cannibalism in captivity which have in most cases resulted in the death of both Pythons. They are predominantly terrestrial reptiles so height of the environment you are providing is of little importance, however, in captivity they have been known to utilize any trees, branches or hides or the like when provided in search for warmth if there is insufficient heating. Aspen based fine chip is of benefit for these critters, we have found that being a burrowing animal they love to bury themselves in 0.20-0.25 meters (0.65-0.8 feet) deep substrate. It is also easy cleaning for hatchlings through to Juveniles as the fast growing animals that love their food tend to excrete more when fed more often. It is recommended to keep your Aspidites melanocephalus in a natural light pattern that mimics normal daytime according to the season. Regarding heating you should accommodate a warmer hot spot such as an approximate temperature of 32°C to 36°C (89.6°F to 96.8°F). Ambient temperature should be 25-27 °C (78-80 °F). Heat Mats or Heat Cords are a preferred method among keepers, as they are predominantly terrestrial the ground or floor heating is of more benefit to them to absorb their required amounts of heating. Pulse proportional or Dimmer controlled Thermostats are a must for heating applications used for the safety of your reptile no matter which species. Humidity should be kept at a minimum but on the occasion during warmer months a spray of fresh water seems to excite this species. They seem to really enjoy raising their heads as if to stick their heads into a shower of rain on a hot summers day. Hatchlings through to Sub adults need a good supply of food to give them a substantial start in life. Hatchlings are started off on Fuzzy Mice or Velvet rats, which may sometimes depends on the individuals tastes as to which food item they prefer. Once thought that food is good & start to feed they generally don’t look back & turn into very ravenous feeding machines. 5-7 day feeding up to Sub adults is a great way to get the young off to a good start with 10-14 day feeding for adults. In captivity these reptiles tend to be prone to fatty organ conditions due to their change in natural diet from predominantly lean reptiles to oversize captive bred rodents, if Rodents are of choice then smaller sized, more of & more frequently will be your better option for Adult BHP’s. Most types of food will be accepted when offered & can range from Quail, Rodents, Rabbits, Chickens, Chicken peaces, fish & reptiles etc. Black-headed Pythons are a tolerant and hardy Python for most reptile keepers. However being a predominant Reptile eater as mentioned earlier they will suffer from long term health issues if fed fattier food items, health risks such a Fatty liver, heart or general fatty organ diseases are a common cause of BHP’s dying suddenly in a collection. Like all pythons though they can also occasionally suffer from respiratory infections which are generally caused by excessive lack of husbandry, prolonged exposures to cool breezes mostly from Air Conditioners, cold drafts & of course long extended periods with no heating. If a respiratory infection is left undiscovered or untreated they will in most cases contract Pneumonia and death can usually follow. Consult your vet immediately.